Sweet and slightly peaty, I am very proud of having made gravlax into an almost Irish dish! I actually prefer this to traditional gravlax with dill mustard sauce. Check the salmon for any bones your fishmonger might have missed (rubbing your hand along the flesh is the best way to find them). Remove any you find with tweezers. Line a dish, big enough to hold the salmon, with a double layer of foil (I usually put the salmon in a roasting tin). Put one of the pieces of salmon, skin down, on top. Rub it all over with half the whiskey. Mix the sugar, salt and pepper, dill and apple together in a bowl and spread it over the salmon. Pour on the rest of the whiskey and put the other piece of salmon (skin side up) on top. Pull the foil up round the fish then put some weights on top (cans or jars or a heavy cutting board, for example). Put this into the refrigerator and leave to cure for two to three days, turning every so often. Liquid will seep out of the salmon in this time, you can just pour it off. Remove the foil and scrape the cure off both pieces of fish. To serve, slice the salmon just as you would smoked salmon (leave the skin behind). Use as you need it and keep, wrapped, in the refrigerator. It will keep for a week. 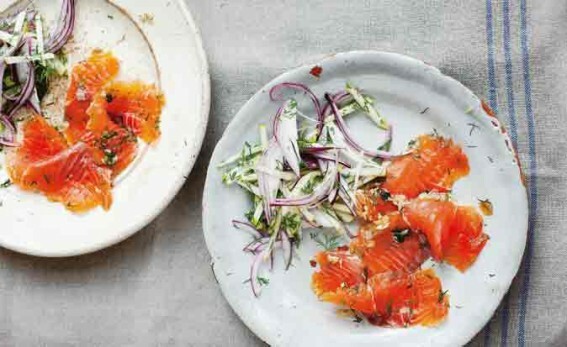 Unexpectedly good with this version of gravlax, a salad that is a great balance of sweet and tart, and brilliantly refreshing with the fish. Halve and core 3 tart eating apples, then cut the flesh into little matchsticks. Cut 1 red onion into wafer-thin slices (on a mandolin if you have one). Mix 6 tbsp rice wine vinegar with 4 ½ tbsp caster sugar and stir until dissolved. Toss the apple and onion immediately with this and add 2 tbsp chopped dill. Serves 6, but easily doubled.